When it comes to treating mental illnesses – especially depression – the options are unfortunately extremely limited. 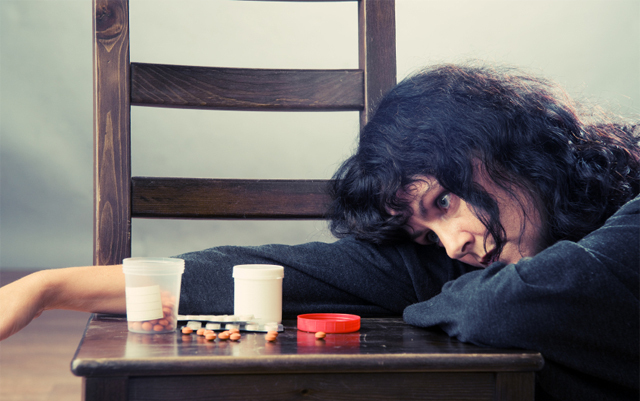 Most of the time pharmaceutical drugs can take weeks, if not months, before the patient notices a difference and oftentimes antidepressant medications are extremely addictive with a long list of potential side effects if you quit taking them suddenly. The worst part is that antidepressants only work for some people – at least 1 in 3 people with depression are unable to find relief through current antidepressant drugs. There are, however, alternate courses of treatment. Since medical marijuana has been around, we’ve been hearing about more and more cases of people who are able to find relief through cannabis – and we’ve often associated the relaxing effects that it provides with the compound THC. However, recent research shows that CBD has many of the same effects as THC without the psychoactive reactions. On the contrary, CBD is a completely non-psychoactive cannabinoid that works to counteract the effects of THC and other psychoactive compounds. CBD has been researched more and more in recent years and is being considered somewhat of a miracle compound due to its amazing success rate when it comes to treating epileptic seizure conditions of all sorts. Now it appears that CBD is also an extremely effective antidepressant. A study done on OBX mice (mice which are surgically modified to act as a stand in for testing of depression medications) found that the mice that were treated with CBD showed an almost instant improvement in their condition – around 30 minutes after the CBD injection the mice were observed having a noticeable decline in hyperactivity, which is a symptom of anxiety and depression in humans. “Our findings indicate that CBD could represent a novel fast antidepressant drug, via enhancing both serotonergic and glutamate cortical signaling through a 5-HT1A receptor-dependent mechanism,” researchers wrote. Unfortunately, due to the schedule I status of cannabis it has been difficult to do studies on the subject of CBD and depression until recently. However, this could soon change if congress were to pass the CARERS Act, which would successfully remove cannabidiol from the controlled substances act all together, while also rescheduling cannabis from Schedule I to Schedule II – which is something scientists, doctors, and advocates of reform have been hoping to see for years now. The fact that CBD could be used as an effective treatment for depression – and that it could start helping patients feel better within an hour of starting treatment – is simply incredible in and of itself. There are millions of people suffering from depression in the United States alone – antidepressants can be dangerous, addictive and expensive for life-long treatment; but CBD oil would be a safe and almost instantaneously effective. It likely won’t be long before some sort of human study is done – whether controlled or purely observational for those already medicating with CBD. If all the results come out with as much success as this first study on mice, then we could be looking at the best antidepressant ever…and it’s been growing around us for thousands of years. Julia Granowicz is a professional writer who enjoys writing about the growing cannabis industry and legalization movement. Alongside her partner in life and business she was able to found R&J Creative Services and in under a year was able to pursue freelance writing full time. Julia lives on the west coast of Florida and loves coffee, the beach and reading and writing fiction in her spare time. I was diagnosed with depression last year due to months of night shifts and a couple of other problems – doctros told me to take SSRIs but I refused to do so and start to take CBD paste (ca. 80-100 mg a day). combined with excercise (jogging 2-3 times a week) and exposion to sun light every day for as long as possible (wasn’t easy in winter moths) I managed to get better quite quickly. My therapist told me to keep taking CBD if it works for me. CBD oil is now legal in the UK, you can buy it online at Amazon UK and Ebay as well as other online stores. This news needs to be spread online, in my opinion CBD oils can save lives so hopefully people with cancer and seizures etc will find out soon. Absolutely! I have used cannabinoids to treat my depression and it has done 10 times more for me than any antidepressant has ever done. Can you tell me what kind of cbd you use and where it can be purchased? Thanks! DEAR aaron: GLAD to hear the cbd stuff helps with depression, i have that complaint, too, since the start of thenew century. but does it workpermantnely or do i have to take it for the rest of m y blooming life? CBD has been a perfect solution for many health disorders. It basically consists of hemp oil. Hemp oil is used from olden days. for treating certain diseases. what do you all recommend as the best brand of cbd? Is oil the best, tinctures or pills? i was suffering from P.A.W this morning and I had Kratom to help, but it was not working. I then picked up some high quality CBD tincture from Cannabis shop here in WA State. I went from feeling like death and hopeless, to feeling a sense of relax and hope. I still fell fatigued due to the opiate withdrawal called Post acute withdrawal – but nowhere near the dark shadows like this morning. Can the CBD made from hemp be as effective, for depression? Seriously consider this! I experience extreme manic episodes on and off and am too susceptible to pharms’ side effects. The other day an episode was peaking, and if i can give any analogy to describe how CBD oil helped it would be this: My depression voice was so loud in my head that it felt like a microphone feedbacking, loud and shrieking, and when I vaped the CBD oil, it was as if somebody just turned down all the high levels, like putting it underwater almost. I could still feel the low rumbling of it, but it was removed and quite. Trust me you get QUITE DAZED, but it is very relaxing. If you have never bought a vape before, they don’t have to be too expensive, but my vape plus the bottle ran me at about $60. The only side effect I experience is heart palpitations when I lie down to sleep, which can be uncomfortable but if you get them you can flip around until they don’t feel as intense, laying on your left side is typically the worst if you are having palpitations. But don’t worry you’re not having a heart attack ha. But speaking of sleep, it also does a very good job of getting you drowsy which is DEF a pro when it comes to depression. Hope this helps. I thought CBD was legal now? At least in CA? Could someone let me know? I have a MM card as well in the state of CA. I have resently tapered off lexapro and a week after the last pill the withdrawal symptoms are terrible. I would not wish this on my worst enemy. I am still having the withdrawal symptoms, it has been i think 3 weeks now. My son told me about CBD and should try it, but I have no idea were to get or how to get it and if I could get it would it be all natural. I am in Tennessee.